As a high school student in Milton, Massachusetts, Luke Nourie took a class in biotechnology and thought, “Wow, I love this. This is what I want to do.” He could see himself pu­rsuing a college degree tied to the field, which drives the booming economy of the Bay State and provides over 63,000 jobs. 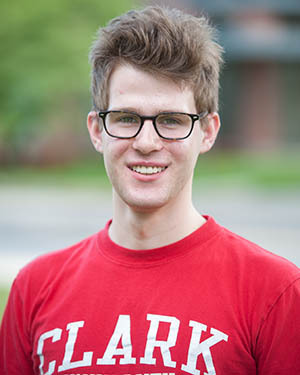 After reading about Clark University in Colleges That Change Lives and learning that Clark was ramping up its life sciences programs, he enrolled in the fall of 2013. The next year, he took a Genetics course with Robert Drewell, a molecular biologist who had just arrived from Harvey Mudd College and had published extensively in scientific journals. 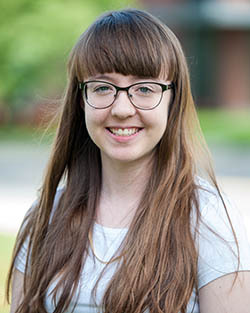 Now a senior majoring in biochemistry and molecular biology, Nourie is a member of the interdisciplinary research team led by Drewell, associate professor of biology, and Jacqueline Dresch, assistant professor of mathematics. He’s received funding via a LEEP fellowship in 2015 and a departmental fellowship last summer. Most importantly, he has developed his own project, with the goal of publishing an article in a scientific journal as a lead author. He’s examining the twin of eyeless gene involved in eye and brain development in fruit flies; mutations of the corresponding Pax6 gene in humans can lead to hereditary eye diseases or improper brain development in the fetus. 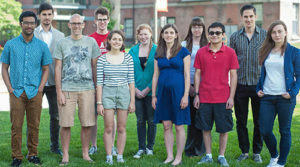 Undergraduate experiences like Nourie’s are integrated into Drewell and Dresch’s research, something the National Institutes of Health recognized when it awarded the professors a $450,900 Academic Research Enhancement Award (AREA R15) Program grant for their interdisciplinary three-year project “Decoding cis-regulatory grammar at Hox genes.” An R15 grant requires investigators to involve student undergraduate researchers, something Dresch and Drewell already have been doing for years. Undergraduate students are very actively involved in the professors’ research on Hox genes, which control the complex cellular development of animals from head to tail. The genes regulate, or “decide,” which embryonic cells will turn into a liver, a brain or another organ. To understand cellular development in living organisms, the professors study fruit flies, or Drosophila, because they are “relatively simple in comparison to humans, and they have fewer genes, a smaller genome and pretty-well-understood development,” she says. Hox genes in both Drosophila and humans are “evolutionarily conserved,” which means they’ve remained relatively unchanged over time. And by understanding normal cellular development, researchers can gain insight into abnormal growth — something that has implications for genetic diseases, including cancer. Abnormal activity of Hox genes in the human fetus, for example, has been implicated in neonatal spinal and neural diseases. Meanwhile, Drewell stresses that he and Dresch are preparing their students for an ever-evolving, highly competitive environment that forces researchers to work outside their comfort zone and base of knowledge. Traina Scholar Rachel Orlomoski ’17, a biology major, chemistry minor and member of the Drewell-Dresch team, conducts research in the lab of Donald Spratt, assistant professor of chemistry and biochemistry and the Carl J. and Anna Carlson Endowed Chair in Chemistry. Spratt’s lab features state-of-the-art lab equipment — including a high-speed centrifuge and a nuclear magnetic resonance spectrometer — to isolate and purify proteins. Orlomoski’s project deals with Drosophila’s FTZ protein, which binds to the DNA in Hox genes and transcribes genetic information into RNA, as a single cell develops into a full-blown fruit fly. Like all of Drewell and Dresch’s students, Orlomoski also uses mathematics in her research. But why apply math and computer science to research on cellular development in the first place? 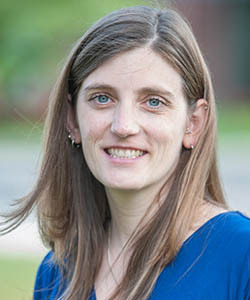 For that reason, she and Drewell focus on training students in bioinformatics, where math and computer science converge with biology in analyzing big data. 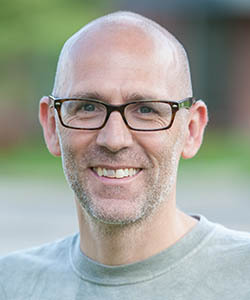 Drewell is director of Clark’s new Mathematical Biology and Bioinformatics Concentration Program. 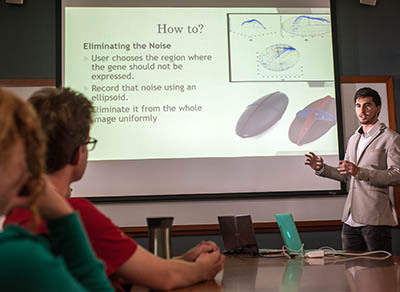 They hold weekly meetings so the entire team of undergraduate and graduate students — drawn from biology, biochemistry and molecular biology, math, computer science and economics — can learn from and weigh in on each other’s research. For students, the training in bioinformatics, as well as the exposure to other disciplines, is invaluable. “Right now, you can’t think about doing biology or biochemistry research without a computational approach,” says LEEP fellow Arianna Brugnola ’18, who worked alongside Nourie in Drewell’s lab last summer and now is developing her own research project in biology. As he looks at Boston’s booming biotech field, Nourie recognizes that “bioinformatics is becoming a major player. They’re hiring a lot of people who know bioinformatics and know how to code. I think it will be really helpful when I go to apply for a job and say I have experience with this tool and that tool.” He has been accepted into Clark’s fifth-year program for fall 2017 and later plans to apply to Ph.D. programs. students Arianna Brugnola and Luke Nourie. Although math and computer science majors may have more experience using quantitative methods, they also benefit from learning bioinformatics as part of a real-life research project. Michael Gaiewski ’18, a mathematics and economics double major, and Navid Al Hossain ’18, a math and computer science major, worked in Dresch’s lab last summer as part of Clark’s Interdisciplinary Summer Research Program. Working alongside Degen Larkin ’17, a biology major and math minor, Hossain created and applied mathematical models of gene expression, the process through which genetic information in DNA drives the synthesis of protein products. Gaiewski developed computer algorithms to test Hossain’s models. She admits that as a middle and high school biology teacher — her chosen career — she may not have to draw upon such bioinformatics skills or the extensive DNA research she conducted. But she already suspects she’ll profit from having presented and defended her research in Dresch and Drewell’s weekly team meetings. Photo at top: Navid Al Hossain ’18 works with Jacqueline Dresch, assistant professor of mathematics.